Today, Apple announced a refresh of current generation MacBook Pros with the Retina Display, Ivy Bridge processors, and Nvidia Graphics. In addition to a redesigned body, the main feature to the next generation MacBook Pro 15″ is the inclusion of the hugely popular Retina Display which has the highest pixel density of screens available on the market today. Previously only available on the iPhone 4 and iPad, it’s finally found its way onto the MacBook Pro 15″. According to Apple, the Retina Display on the new MacBook Pro 15″ will feature a pixel density of 220 ppi , a resolution of 2880×1800, a viewing angle of 178°, 75% less reflection and 29% higher contrast than the screen found on the previous generation. Performance updates include the latest Intel Core i7 Quad Core CPU, Nvidia’s GT 650M GPU, up to 16GB of DDR3 memory at 1600MHz, and a maximum SSD capacity of 768GB. The updated i7 processor will feature Intel’s Ivy Bridge 22nm fabrication process with a clock speed of up to 2.7GHz (3.3GHz in Turbo mode), while the GT650M is based on the Nvidia’s Kepler architecture and wil feature up to 1GB of GDDR5, a core speed of up to 850MHz, and a128 bit memory interface. As with all previous MacBooks Pros, battery life is still excellent top notch giving you about 7 hours with web browsing, 30 days on standby, and can last 1000 full charge and discharge cycles. Additionally featured is two USB 3.0 ports, two Thunderbolt ports, a new MagSafe 2 power connector, a SD card reader, HDMI out, 802.11n and Bluetooth 4.0. Despite the increase in performance and excellent battery life, the new MacBook Pro didn’t gain any weight; in fact, it actually lost some. Measuring in at only 0.71 inch and 4.46 lb, the new 15.4 inch MacBook Pro is 21% thinner and 20% lighter than the previous generation. This is a blessing to travelers and students who are constantly running around campus all day. However, performance and pixel density aren’t the only things that went up as the price did too. The entry level MacBook Pro 15″ with the Retina Display which comes with a 2.3GHz Intel Core i7 Quad Core CPU, 8GB of memory, and 256GB of flash storage now checks in at $2199, a full $400 more than the entry level standard MacBook Pro 15″. But Apple also offers a version of the updated MacBook Pro without the Retina Display that’s priced at the regular MacBook Pro price of $1799. 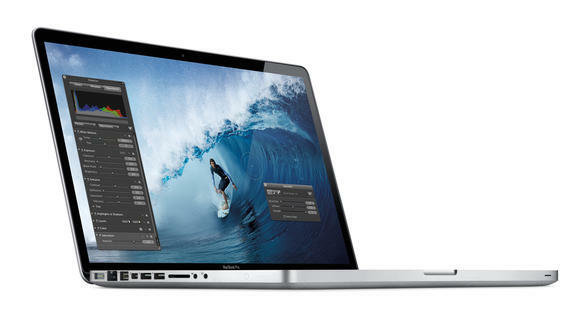 SAN FRANCISCO—June 11, 2012—Apple® today unveiled an all new 15-inch MacBook® Pro featuring a stunning Retina™ display, all flash storage and quad-core processors in a radically thin and light design. Measuring a mere 0.71 inches and weighing only 4.46 pounds, the completely redesigned MacBook Pro sets a new standard in performance and portability for pro users.